Mosaic patchwork, sometimes called “paper piecing,” originated in Britain at the beginning of the 18th century and was carried to America by British colonists. Its popularity peaked in the early 19thcentury. The technique involves wrapping fabric, usually cotton, around a paper template and basting the paper and fabric together. These patches, sometimes thousands of them, were then sewn together to make a quilt. The technique required the maker to have a certain amount of wealth because paper and fabrics were expensive. Paper, originally made from rags, became more affordable in the 1860s when wood pulp began to be used to produce paper. Before then quilt makers might have recycled the templates or used paper documents or letters to make them. Cotton cloth was also imported until the 1820s; by the 1850s a wide range of cottons began to be produced on this side of the pond, lessening the cost substantially. The mosaic patchwork technique was quite laborious so only ladies with ample leisure time could undertake it. Belle Abram, who lived in United Kingdom, spent nine years making the Medallion quilt shown here. For the earliest mosaic designs, the makers folded and cut paper along diagonals to make triangle or square templates. The shapes became more complex by the late18th century when women, who were not traditionally taught mathematics, studied geometry textbooks to learn how to make hexagons and other shapes not possible by simply folding paper. Although we appreciate these quilts as artworks, the makers didn’t see themselves as artists. These quilts may have been used, but their good condition suggests they became cherished keepsakes handed down through generations. 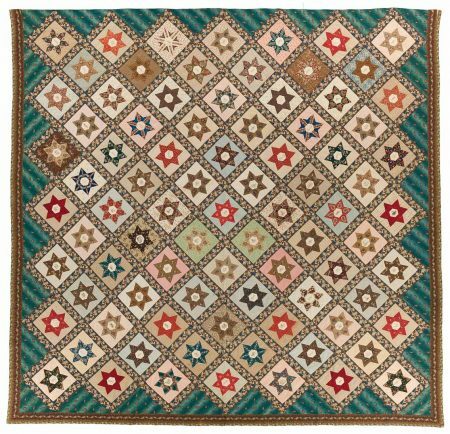 Rebecca Scattergood Savery (1770-1855), Star Signature, probably made in Philadelphia, Pennsylvania, dated 1844, cotton, mosaic patchwork, hand-quilted. International Quilt Study Center & Museum, University of Nebraska-Lincoln, 1997.007.0118, Ardis and Robert James Collection. 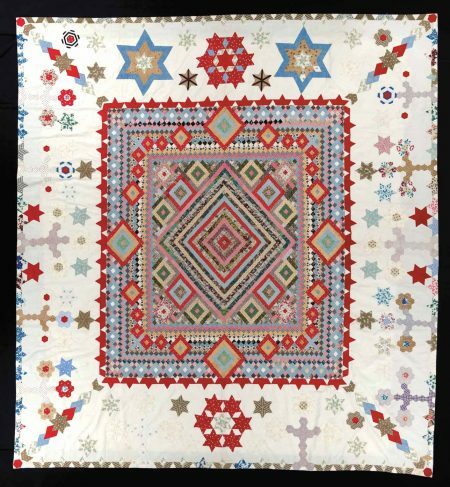 The maker of the Star Signature quilt, Rebecca Scattergood Savery, is known because she “signed” it in ink in a white hexagon at the center of one of the 82 mosaic patchwork stars. She also wrote the names of her husband, Thomas, and some of the members of their Quaker community in the Delaware Valley near Philadelphia in the stars. There are also meticulous ink drawings of a squirrel, a beehive, a hunter with his dogs, etc. It’s thought that Quakers, on both sides of the Atlantic, helped keep the British mosaic patchwork technique alive in America. 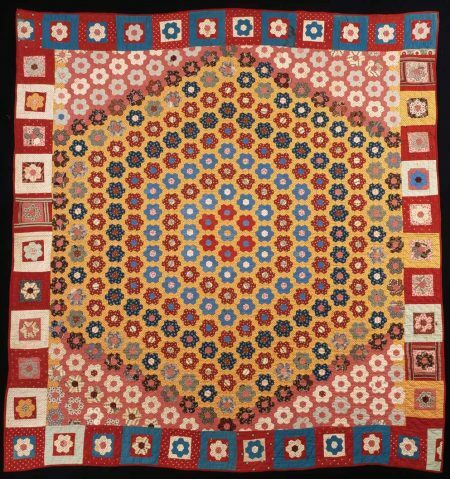 Hexagon Quilt, possibly made in New England, about 1870-1890, cotton; mosaic patchwork, hand-quilted. International Quilt Study Center & Museum, University of Nebraska-Lincoln, 1997.007.0238, Ardis and Robert James Collection. The unknown maker of this Hexagon Quilt used the medallion format where the central area dominates the design. She used same-sized hexagons to create daisy-like shapes that she then marshaled into concentric hexagons. The border of squares of alternating colors with a flower with squared off petals lacks the precision of the center and makes the quilt all the more charming. Hexagon, maker unknown, possibly made in Kentucky, 1860-1880, wool, mosaic patchwork, machine appliquéd, machine quilted. International Quilt Study Center & Museum, University of Nebraska-Lincoln, 1997.007.0598, Ardis and Robert James Collection. Travel along the Ohio River made it possible for many New Englanders and those from the mid-Atlantic states to settle in the area, bringing their quilting traditions with them. In the early 20th century, Kentucky became known for its quilt making and that recognition continues today. 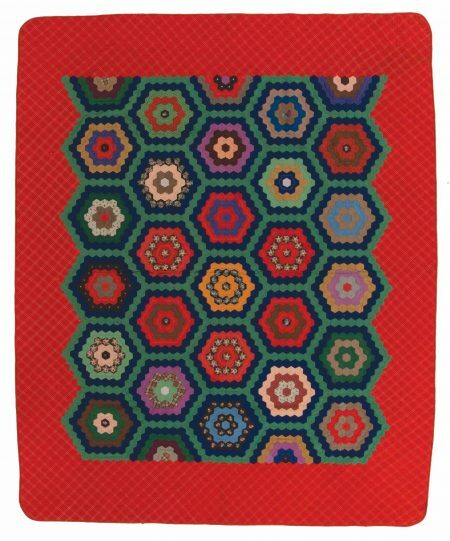 This wool Hexagon Quilt, possibly made in Kentucky, 1860-1880, is quite unusual. It is a variation on the traditional medallion composition being taller than wide. Hexagonal patches made of concentric hexagons were pieced together to make the medallion. This was appliquéd onto the tomato red ground, which has diamond shapes outlined by two lines of machine stitching. Sewing machines began to be used in domestic situations in the 1850s, significantly shortening the time needed to make a quilt. Medallion, maker unknown, probably made in New Hampshire, United States, 1860-1880, cotton, mosaic patchwork, appliquéd, unquilted. International Quilt Study Center & Museum, University of Nebraska-Lincoln, 1997.007.0818, Ardis and Robert James Collection. I was quite taken by this unusual Medallion quilt, c. 1860-1880. In addition to the mosaic patches, it also features appliqué. The center medallion is quite traditional, but the maker began to stray with its “frame.” What distinguishes it is that she’s appliquéd various sizes of diamonds on top of the rows of small diamonds that make up the frame. She placed a large star, which looks somewhat like a Kenneth Noland or a Josef Albers, in the center of each side and flanked it with medium-sized and then smaller diamonds. These diamonds are still larger than those of the medallion. Surrounding this kaleidoscopic design is a wide white border appliquéd with star shapes, diamonds, posies, and what I see as geometric gingerbread men. This white border relieves the claustrophobic central design. The medallion is hand-stitched to the white border, and the maker has machine stitched a backing fabric to the center only. The quilt is original and joyful. The exhibition is not only a visual delight, but there is a strong educational component. Not only is the mosaic technique explained, but also there are concise chronologies of paper and cotton that trace how they became more much more affordable with technological advances and production being switched from the United Kingdom to the U.S.A. If you come to the Taft for the Antique Christmas display or a cream tea, don’t miss “Elegant Geometry” and, at least, peek into the Sinton Gallery to see “A Sense of Home: New Quilts by Heather Jones.” Her minimalist quilts are informed by traditional quilting and contemporary art.